by Antonio Neri 1598-1600, f. 19r. The fact that Antonio Neri was both a dedicated alchemist and a Catholic priest may seem a bit odd to current sensibilities. 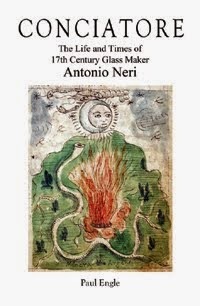 If we take a broader view and try to accommodate history, the situation can seem odder still since in Neri's time, the late sixteenth to early seventeenth century, alchemists were sometimes portrayed as practicing sorcery. As far as the Church was concerned, sorcery was a heretical offence. In some quarters, the seemingly miraculous manipulations of alchemists to duplicate or even improve on materials found in the natural world were seen as tapping into divine powers. As the bubonic plague ravaged Europe, finger pointing at suspected culprits for bringing down the wrath of God was not terribly uncommon. Nevertheless, the fact is that Antonio Neri was both a Catholic priest and an alchemist, and in good standing on both counts. To understand how this could occur, we need to scratch beneath the surface of history a little deeper. Taking an even longer view, we see that both religion and alchemy have been practiced for a very long time, since before recorded history. Both conferred cohesive benefits to society and both required the keeping and passing of secretive knowledge. In this light it becomes very reasonable that the two disciplines might be conducted by some of the same people. Muslims, Hindus, Buddhists, Jews, Christians, all have rich traditions of alchemy that stretch back to their beginnings. That religion and alchemy coexisted for so long is really a pragmatic issue; alchemy formed the foundation of medicine, metallurgy, the production of paints and many other arts. It was essential to even very small communities, not to mention the advent of distillation: the art of producing a good stiff drink. When a religion, any religion, was adopted into a community, the practices of the community were also adopted into the religion. From this we can infer that the ancient practices that eventually became alchemy were alive and well in the prehistoric Mediterranean tribes, in Celtic and Etruscan societies and in the Asian states long before written history. Now, returning to the early 1600s and Antonio Neri, many Christian orders boasted long traditions of alchemy. The Dominicans had Albertus Magnus, the Franciscans had Roger Bacon and Ramon Llull. It is true that in the fourteenth century, Pope John XXII signed a decree banning the counterfeiting of gold and silver by alchemical means, but this has often been wrongly interpreted as a general prohibition, which it was not. In fact, there is every indication that this pope, a trained physician, was well acquainted with the positive benefits of alchemy. Furthermore, the prohibition did not it stop a long line of chemical experimenters within the Church from trying their hand at gold transmutation. In a more pedestrian vein, monks in far-flung monasteries regularly maintained herbal gardens from which they distilled medicines and spirits, and made pigments for paints using alchemical methods. Monasteries were the repositories of knowledge and within their walls, alchemical texts were studied closely. Neri's specific affiliation, his sect, within the Church is currently unknown although there are a few good guesses. His sponsor was Medici prince Don Antonio, who maintained a palace laboratory called the Casino di San Marco on the north side of Florence; this is where Neri worked at the beginning of his career. The laboratory was located directly across the street from one of two apothecaries maintained by the Dominicans. It is hard to imagine that there was not some kind of relationship between two facilities, both practicing alchemy mere steps from each other on opposite sides of the same street. This apothecary was part of the San Marco Convent complex, which a century earlier harbored Savonarola. There are strong indications that Neri’s family was sympathetic to his reform minded agenda. Savonarola sponsored the first Florentine pharmacopoeia -- a book of medicinal recipes used by physicians and apothecaries. Neri's father, who happened to be the grand duke's personal physician, presided over a later revision of the same book. Neri's sponsor, Don Antonio, held high office in the Knights of Malta, a religious military order which reported directly to the pope and had great latitude in the types of projects it pursued. The Knights of Malta ran two churches in Florence and Neri can be connected to both. The order traces its roots to the crusades and has various associations with alchemy such as George Ripley. One legend tells that Ripley helped to finance the knights through the production of alchemical gold. The knights followed the rule of Augustine and enjoyed a close relationship with the Augustinians. The Augustinians counted a Francesco Neri as abbot of their San Clemente monastery near the Casino. The same abbot Francesco also worked for Don Antonio de' Medici at the Casino and may have been Antonio's brother. Antonio's aunt, Faustina, apparently entered an Augustinian convent after the death of her husband. But there is no shortage of other possibilities; as a child, the priest's home parish church was the Benedictine San Pier Maggiore. His father was buried at a Cistercian church, his grandfather at the Franciscan cathedral. At the end of his life, Antonio Neri's confessor was a Carmelite, but also served as the parish priest of an abbey run by the Canons Regular of the Lateran. 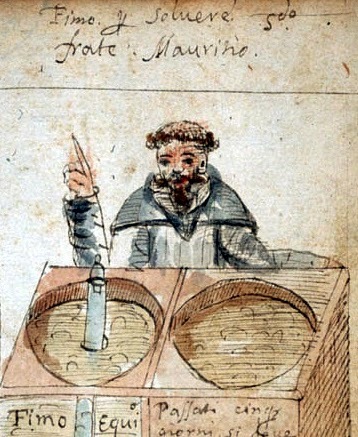 Whichever group served as his base of operations, through Antonio Neri, they continued a very long tradition of alchemy practiced within the Church.